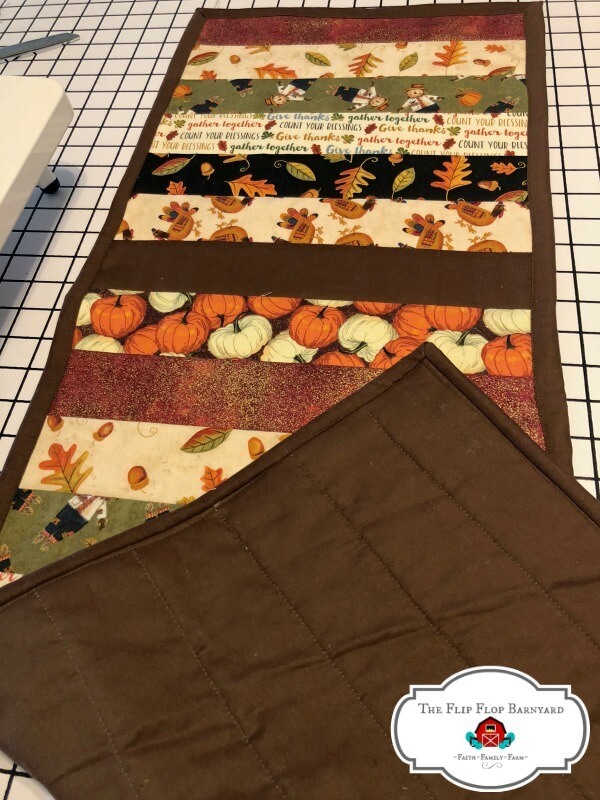 I decided to make a quilt as you go table runner because I saw them on Pinterest and thought they were adorable and I loved the idea of combining all of the quilting steps into one for a fun and quick sewing project. 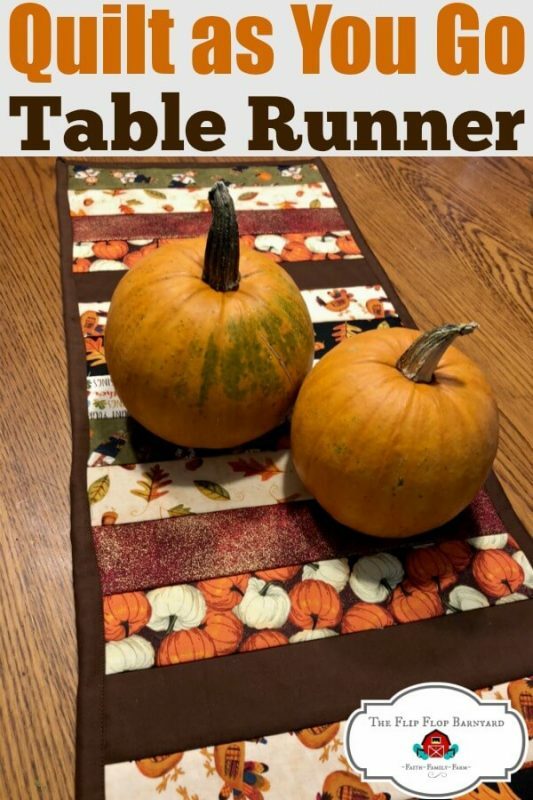 For this particular table runner, I chose fall/autumn themed fabric because it was just about that time of year. This can be made using any design fabric. I plan to make one for each season and/or holiday. 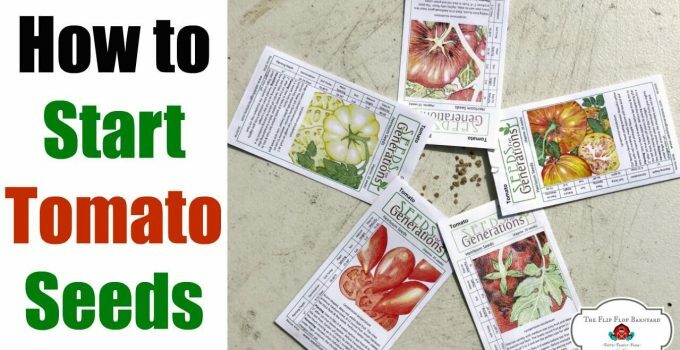 It is a quick and simple project- perfect combination! I’ve talked to you before about sewing and quilting (in my rag quilt tutorial), it’s one of my favorite hobbies. I like things that are fun and practical and sewing encompasses both of those perfectly. I love creating something beautiful that also serves a great purpose. It just makes me happy inside. Note- This is a how to guide, not an exact pattern. The amount of fabric you need will depend on the size of your personal table runner. I’ll share the dimensions of mine but you may want to make yours a different size. First things first, what size should this table runner be? Well, it can be any size you’d like! You want to be sure that it fits the table you will be displaying it on. I read out there on the interwebs that a good rule of thumb is to make it 1/3 of the width of your table (example: 36″ wide table= 12″ wide runner) and to allow for 12″ of overhang on each end. Now, I have a really long farmhouse table to fit my family of 10. I chose to make mine more of a centerpiece rather than a ridiculously super duper long runner. I’m a rule breaker when it comes to these things. Basically, you can make it whatever size you want. 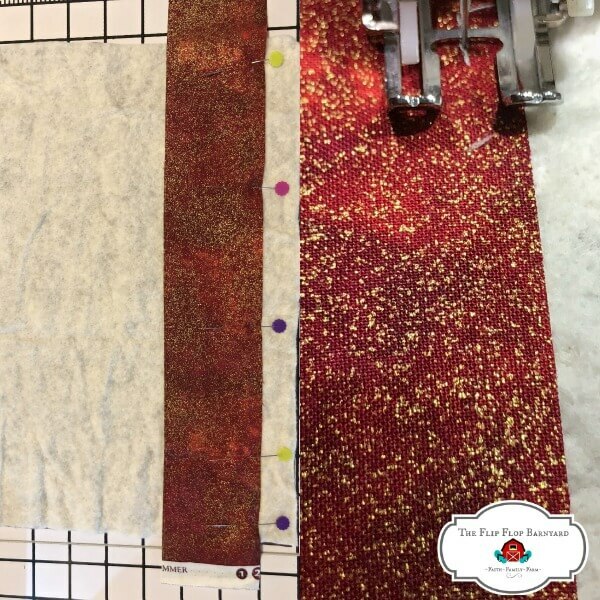 One more thing that I wanted to make note of is that this is a perfect project for a Jelly Roll (roll of 2 1/2″ strips of coordinating fabrics). 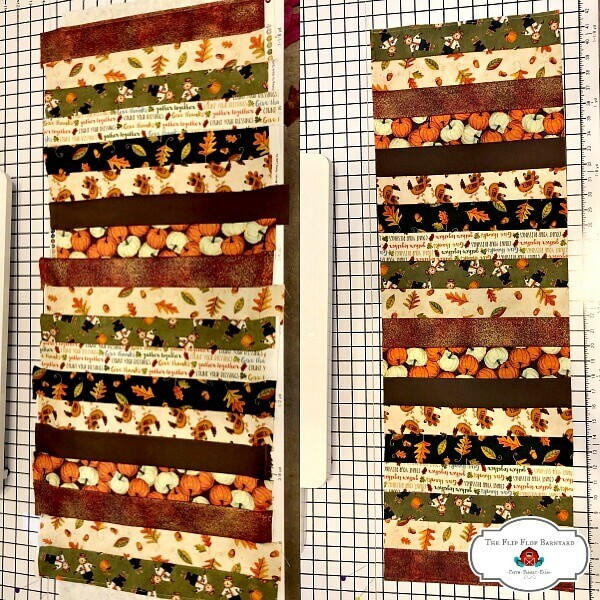 In fact, I had every intention of using a Jelly Roll when I set out on this project but alas, I could find none to my liking in the autumn theme that I desired. I ended up picking out 8 different prints and cut my own 2 1/2″ strips out. Which actually brings me to one more thing- They do not have to be 2 1/2″ strips, I just used that for mine, you can make them varying sizes if you’d like. I really just want to show you how to quilt as you go for a super cute table runner to brighten up your home. Fabric- Top; a Jelly Roll or multiple prints of fabric. Batting; I prefer unbleached cotton batting. Backing; a solid piece for the backside of your table runner. Binding; a contrasting color for binding (this can be purchase pre-made or you can make your own by sewing together 2 1/2″ strips of fabric). Thread- Since this is quilted as you go, your quilting is not seen on top. I prefer to use thread that matches my backing and binding for this project. Iron- You’ll need an iron to press your seams as you go. Audience- Ok, not necessary but if you’re a momma like me, you’ll have an audience whether you want one or not. I happen to enjoy mine and they also make good sewing assistants. The first thing that I did was cut my fabric strips out. I left my strips longer than the width of my backing to be sure I had enough. Then, I cut my backing and batting to the size I wanted my finished table runner to be. In my case, that happened to be 12″ wide by 36″ long. You want to lay the backing down (remember to iron it first so its nice and flat) and then add the batting on top. Be sure to square up your corners. Prepare your fabric. If using a Jelly Roll, this step is simple. If using cuts of fabric, you will need to measure and cut out your strips. I use an acrylic ruler, a rotary cutter, and a rotary mat for this step. You’re going to begin assembling your table runner now. Start by taking your first strip and laying it right side up on your layered backing and batting. I lay and pin the first strip about an inch or so from the raw edge of the batting. Now, I sew it down on the outer edge of the strip at 1/4″ seam allowance. This is where the magic happens and your creation comes alive. Now, you will take your second strip and lay it right side down on the first strip (so that the two are right sides to together). 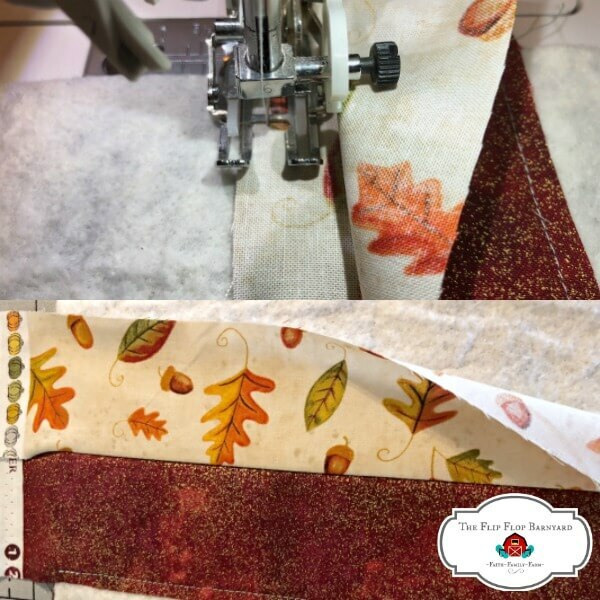 Sew the strips together along the edge at 1/4″ seam. Press the new strip open onto the batting. Repeat this step until you reach the end of your batting. If you get to the bottom and don’t reach right to the end of the batting and have over hang but not enough for another strip, just trim off the excess backing/batting to be even with you last strip. Sew the final strip down along the raw edge at 1/4″ seam. 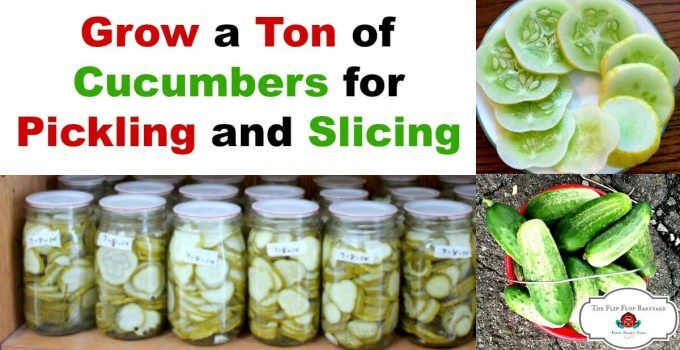 Now, just trim off the overhang to make your edges even all the way around. 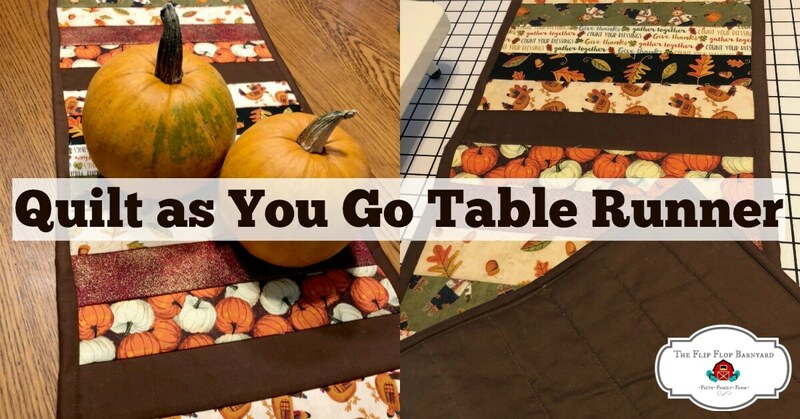 At this point, you have a finished quilted table runner! All thats left to do is to bind that baby up! You can hand bind it or machine bind. I always machine bind because I just prefer that. If you love hand binding then go for it! I don’t have a binding tutorial up (YET!) but I love this video one by Jenny Doan of Missouri Star Quilt Company (She’s totally my quilting hero). It’s finished! YAY! Now, pat yourself on the back. You can place it on your table or you can gift it to bless someone with a handmade piece of artwork to adorn their home with. Please don’t hesitate to ask me any questions if you aren’t grasping something that I’ve said. I have also addressed some frequently asked questions below. What does quilt as you go mean?- It simply means that you are sewing your decorative fabric down to the backing and batting at the same time as assembling the top. This is a quicker way to make a quilt rather than assembling or piecing the top alone and then quilting all three layers together. What are the right sides and wrong sides of fabric?- The right side refers to the top or the print side of the fabric, the wrong side is the backside of it. What is seam allowance?- The seam allowance is how far you are stitching the fabric from the edge. For this project (and for quilting in general), I use 1/4″ seam allowance. What is binding?- Binding is the fabric that is sewn around the outer edge of a quilt project to cover (or bind up) the raw edges. What is a rotary cutter and mat?- A rotary cutter is a round blade that rolls across your fabric to cut it. It kind of looks like a pizza cutter. They are used instead of scissors. You need the rotary mat (a mat made specifically for this) under the fabric as your cutting surface when using it. What is batting?- Batting is the middle insulating layer of a quilt project. It can be made from cotton, polyester, or a blend of the two. I typically prefer 100% cotton for my projects. What is backing?- Backing is the solid (or print) piece of fabric used as the backside of a quilting project. What is a Jelly Roll?- A Jelly Roll is a roll of pre cut 2 1/2″ strips of fabric that are typically 36″ long. The term Jelly Roll is actually a brand specific name but most people refer to all brands as a Jelly Roll.